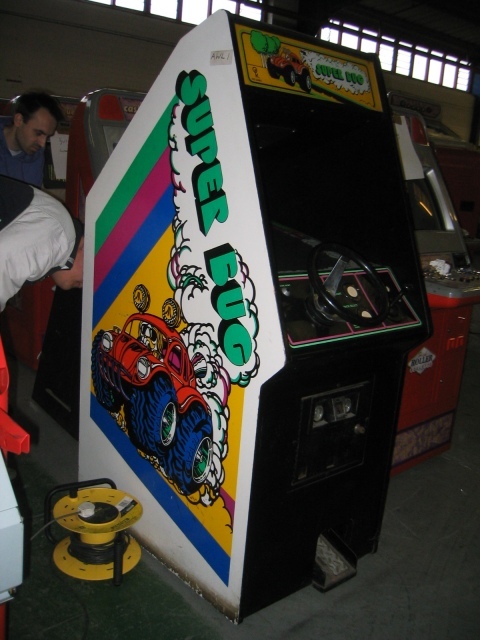 That super invaders with the x-wing on the bezel is probably supposed to have the bezel that's on the clowns cab, same typeface. These cabinets really deserve to be saved! Seems like a "bulk save" is coming! I agree, I have a weak spots for the boots too. Weird eh, some bootleg records are worth a lot, but bootleg cabs always seem to get very little money. In fact prices should be higher because they are much more rare ! Whatever happened to these ?? I know it's been ages but I'm still working on rescuing these cabs. Calling the guy from times to times via my friend "KID". Owner lives super far away and we still haven't agreed on the final price (he wants something like a 100€/each). If that ever happens, would somebody here be interested in buying back some of them from me? I don't really need them but it would break my heart to hear that they have been destroyed. Mind you: the one we already brought back were completely non functionnal so whoever will buy them must be prepared for some resto action. We weren't allowed to open them so I don't even know if there are PCBs in there. Sorry man, all out of space but I feel just the same, these should not be destroyed. Isn't there some European subsidy we can get ? Maybe we should start the "Dark, weird and rare Euro arcade cabs liberation front" and "set them free"
Anyway I should work on trying to get them to my storage and then check back here to see if there's any interest but that's a huge job. Strange... but wonderful! News about these cabinet? You have saved them, right? ?